A quality education from kindergarten through high school is crucial for children to build a firm foundation for a successful college career and a productive adult life. Many factors affect the quality of support children are given in and outside of school, thereby influencing the quality of education a child receives. In particular, poverty affects a students’ health, ability to focus, and ultimately, their educational success. The metric associated with K-12 success is “college and career readiness,” in alignment with the efforts of 55,000 Degrees. Louisville has a target goal of 100% college and career readiness among graduating high school students. 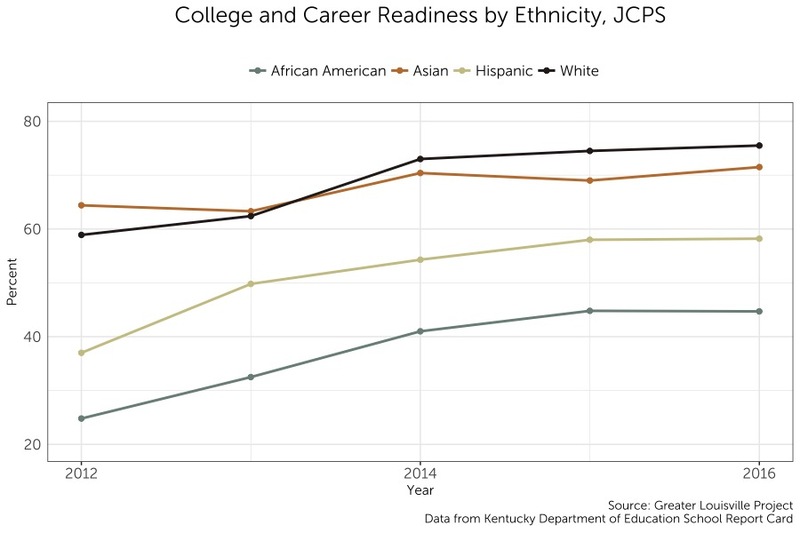 The percentage of students who are college and career ready in Louisville has recently stagnated despite steadily increasing from 2012 to 2014. 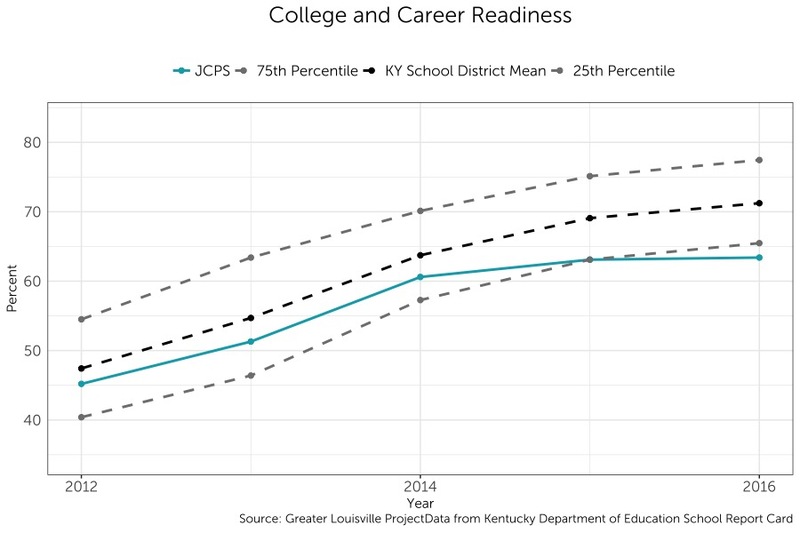 Louisville fell from near-average among school districts in Kentucky in 2012 to below the 25th percentile in 2016. While Louisville has not yet experienced a decline in college and career readiness among high school graduates, it must regain the positive momentum seen in earlier years to remain competitive and provide high school graduates with the tools they need to succeed. Students of all races experienced an increase in college and career readiness from 2012 to 2016, though there are major differences between them. White and Asian students have much higher levels of college and career readiness than Hispanic students and African American students. White, African American, and Hispanic students saw large gains in college and career readiness from 2012 to 2014, which then slowed from 2014 to 2016. Asian students’ college and career readiness has wavered depending on the year, but Asian students progressed overall from 2012 to 2016.